I’ve tried more headphones than I can count. Some sound amazing, some sound terrible, and some require DIY modding to get juuuuuust right. The $400 Nuraphone, however, is the first headphone I’ve tried that’s given me a completely unique experience that puts it in a category all its own. The Nuraphone’s novelty starts as soon as you put them on your ears. Instead of a traditional over-ear design, the Nuraphone uses a hybrid form factor of sorts: it’s an over-ear headphone, with in-ear tips in the cups. We’ll talk a bit more about that in a bit, but the rest of the headphone is well-built: the pads are made of a very soft rubber that exudes “premium,” and the adjustable band is smooth as butter. There’s no power switch, instead relying on sensors to determine when it’s on your head. Put it on, and it’ll prompt you to connect over Bluetooth, download the Nura app, and perform a listening test which will customize the sound based on on your individual hearing. The Nuraphone isn’t the only headphone to alter its output for your ears—Beyerdynamic’s Aventhoo Wireless and the Kickstarted B&B Pure come to mind—but those other headphones perform their listening test differently. They’ll play tones, one by one, and ask you to press a button whenever you begin to hear each tone. Nuraphone, on the other hand, automates the entire process, playing a sweeping set of tones over the course of a couple minutes, using microphones inside the ear tips to detect the small vibrations coming back from your eardrum. From that, it can determine which frequencies you’re more or less sensitive to, and adjust its sound accordingly. It’ll even show you your listening profile in the form of a visual “blob”—12 o’clock in the circle represents low tones, with the frequency getting higher as you go around the circle. If the blob bleeds outside the circle boundaries, those are frequencies you’re sensitive to—if the blob shifts inward, you’re less sensitive. It stores these profiles on the headphone itself, so you can use it on any device and get your ideal sound signature without fiddling with equalizer apps. The result is a remarkably well-balanced frequency response: after setting up my listening profile, highs were clear without being too sibilant or tinny, and the mids were just the right amount of forward (I could have done with a bit more clarity in the midrange, but that’s a personal preference most people don’t share). Bass was a different story: it was customizable thanks to the Nuraphone’s “Immersion Mode” slider, which lets you boost or reduce bass to your tastes. However, while most of your music will come from the Nuraphone’s in-ear tips, the lowest frequencies come from the larger drivers behind the ear cups, providing vibration to your outer ear that makes the bass feel much more full and natural than if you were just wearing bass-boosted ‘buds. Out of curiosity, I had a friend perform the listening test as well, to see how much the Nuraphone was actually doing. Her profile sounded terrible to my ears—it was way too forward in the high end, and lacking volume in the midrange, producing a hollow, uneven sound. I also noticed that, as a result of me having a bad seal in my left ear, the Nuraphone was compensating in my profile by boosting the left channel compared to hers. (I later figured out that if I slid the headphones “forward” on my head, I could get a better seal in both ears—at which point I re-did my listening test.) 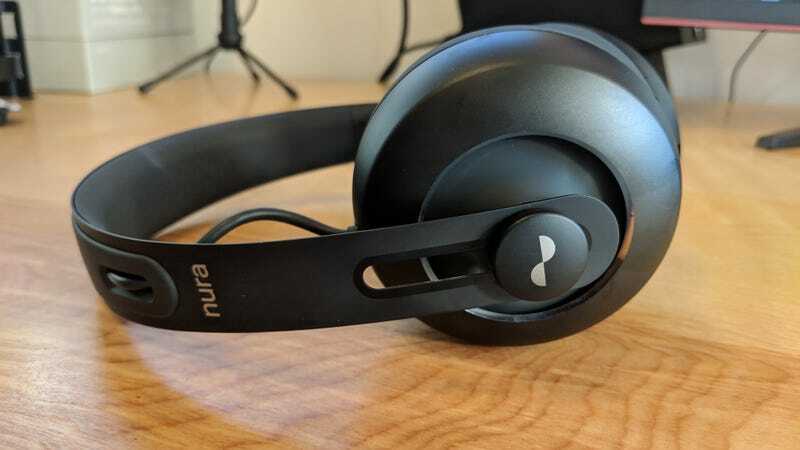 The Nuraphone was clearly doing its job, and doing it well—so much so that I now wonder how differently I hear regular headphones compared to other people. On top of its listening profiles and adjustable bass, the Nuraphone offers customizable touch controls—tapping once or twice on each side of the headphone can skip tracks, pause the music, or turn the volume up and down. I ended up disabling these as I kept invoking them by accident, but in the age of AirPods, they’ve become an “expected” feature on high-end wireless headphones, so I’m sure some will appreciate it. Battery life was impressive, as I’ve spent hours listening to music via Bluetooth over the past two weeks and the battery still hasn’t kicked the bucket. You can buy 3.5mm and USB-C cables if you prefer a direct connection for $20 each (or $40 for a Lightning cable—thanks, Apple). The Nuraphone’s biggest weakness was its comfort—or lack thereof. 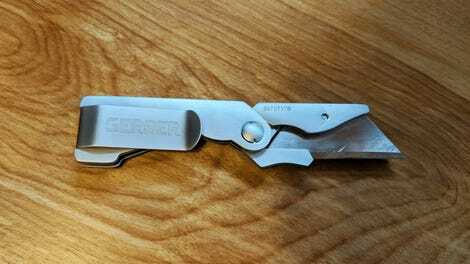 The hybrid form factor is tough to get used to at first. You have something in your ears at the same time you have clamping force on the sides of your head, and moving your head or opening your mouth produces a really off-putting feeling. (If you like to bang your head while listening to music, these may not be for you.) Wearing them for a while produces a noticeable pressure inside my ears from the tips, but I imagine some people will notice this more than others, depending on the size and shape of your ears. That said, after a few days—and after swapping in the smallest set of ear tips (even though I’m a “medium” in most earbuds)—I got used to the fit somewhat. They still aren’t as comfortable as traditional over-ear headphones, but I’m enjoying them much more than I did at first, and can wear them for longer periods of time. So why not just use a traditional over-ear form factor? Nuraphone tells me they took the hybrid approach for a few reasons. First and foremost, this allows for more isolation than both over-ear and in-ear headphones can provide—you’re getting a double seal from the ear tips and the ear cups as well, with active noise cancellation on top. And they definitely do their job in that regard—when I put on the Nuraphone, the rest of the world disappears, and I hear nothing but my music. This form factor is also what allows the Nuraphone to provide a completely automated listening test, and their unique Immersion Mode. The more I listen to the Nuraphone, the more I enjoy them, and the more I appreciate the fascinating technology behind them. If you’re the kind of person that hates having earbuds in your ears, they probably aren’t for you—but if the isolation and clarity of earbuds combined with the natural bass response of over-ear headphones sounds appealing to you, they may be just the ticket. The $400 price tag is not small, but not particularly crazy when you compare it with other wireless noise-cancelling headphones from Bose, Sony, or Beyerdynamic. And you know they’ll sound good, since they’re tuned specifically for your ears.